Previous Post@ 29 months and nursery searchNext PostThe Curious Little Boy…. wah… I LOVE YOU , WO AI NIE!! so sweet!!! Ryan says that to daddy too? or Daddy won’t be back yet when he goes to bed? EM: I give my boy goodnight kiss and said I Love You to him everynight since he was baby. I added ‘Wo Ai Nie’ recently tho as part of my effort to instill more Mandarin into him. EM: LOL… ya ya.. I feel more ‘lum’ when Ryan said I Love You than when I hear it from my hubs. EM: Oh… he can be angel this minute and monster the next….. very unpredictable. Btw, do you practice showering together (mummy n kid)? Since they are boys..better get daddy to shower together? EM: Hahaha… usually when I shower him I’ll end up all wet anyway, so mights well shower together. And I really like this special bond we share. So it’s okay la. Even if he is curious about ‘something’ (usually he doesn’t at this age), I’ll explain to him. Early education ma.. I am really looking forward to my son saying all these to me. Cant wait for him to grow up a little .. now he only knows how to call me “Mie Mie” and smile cheekily. Awwww… how schweet! Melts your heart, kan? Irfan goes “Good night. Sleep tight. Love you. Muaks muaks. Bye!” before he closes his eyes. Haha. The “bye” part yang cannot tahan tu. LOL! mommy little boy lo. So sweet. oh, so…..sweet~. My son only kiss me when I am angry. awwwww….such a good boy!! how heartwarming. 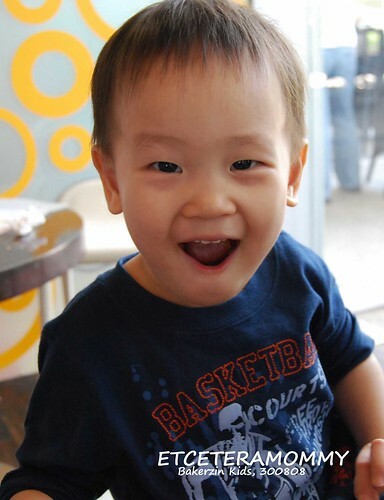 Kids at this age are simply adorable….29 months? Hmmmm, time to get another one, a sister for him? Have a great week and best regards, Lee. Wow..so lum ar!! So sweet of Ryan!! awww… that’s so sweet! I would have melted too. aiyo… He’s such a sweet boy la!! So sweet of him…i’m melted too when reading the magic words..